Mechanic's Assistant: How old are the hoses? And just to clarify, can you actually see the leak? 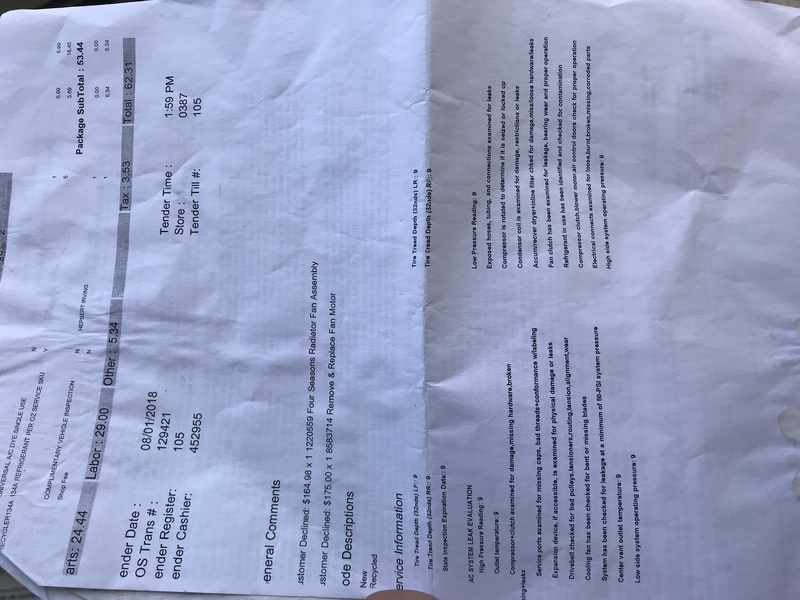 I took it into a pep boys and they assured me that through the smoke test there were no leaks They diagnosed it as the radiator fan assembly being bad But if that were true, wouldn’t I have problems with over heating? AC on, grab the evaporator hoses at the firewall. Are you getting cold lines in and out there? 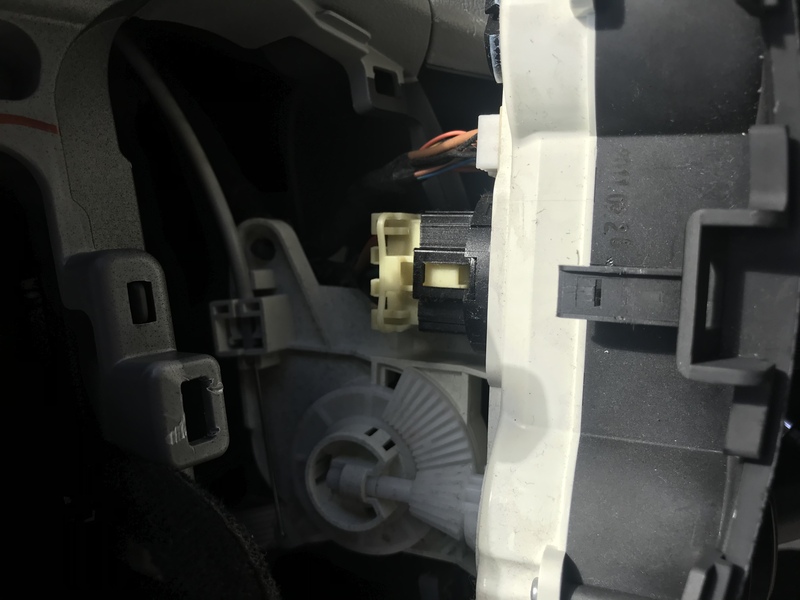 Thanks, ***** ***** your AC is working and the issue is in your dash. It is going to be the climate control, blend door actuator, wiring, or blend door. One of them is faulty and no allowing the air to only go through the evaporator. Do you know how o access the actuator and manually move it? Does your car have manual or auto HVAC? All repairs can be DIY. However it all depends on the person doing it, there skills, physical abilities and there tools. Unknown until you get inside and check it out. Sometimes repairs can be made instead of new parts installed. How can I tell which is the main culprit so I can replace? You would need to take it apart and test. You may find the only issue is the cable has popped off and no parts need to be replaced, just put the cable back in place. Okay, last question. How can I test the wiring? And once the trim panel is off and the crash pad is disconnected, is the climate control held in by clips or screws? Once you replied more, I came to the conclusion no wire testing was needed once you gave me more info. Using the file I sent prior. Follow this cable to the actuator for temperature control and see if there is an issue there. You said prior (the AC lines were cold) so that means your evaporator is cold. So you should be getting cold air if the blend door, actuator, and cable are working correct. Now it is making more sense. You have an AC issue. We need a gauge set to check the low and high side side pressures to diagnose what is wrong with the AC system. I can partially diagnose with just one gauge but I can not get all that accurate. I would need to know the reading on the gauge min-max with the AC on, blower on speed 2, recirculated air, rpms holed at 2000, ambient air temp, and humidity, and is the engine cooling fan running during the test. GotchaBest guess with the given information? I don’t have all the tools required so next is to take it to another place so they can diagnoseLike I mentioned in the beginning the people at pepboys said it was a fan issue. I know this model carries two fans. One rad fan and one cooling fan, is this a possibility? Or did they just take 60$ from me? Can you respond with the readings and temperatures I mentioned from my last post? So the picture of the can you hooked up is from pep boys? Based on there findings they are indicating the cooling fan is not working however there pressure readings ( 9 ) make no sense. Since it is your can and your gauge, you should be able to respond to each of these. I would need to know the reading on the gauge min-max with the AC on, blower on speed 2, recirculated air, rpms held at 2000, ambient air temp, and humidity, and is the engine cooling fan running during the test. You said you could not measure the high side readings so I asked you to give me the low side readings under all those parameters I mentioned. Time for me to log off, I will be back on tonight. 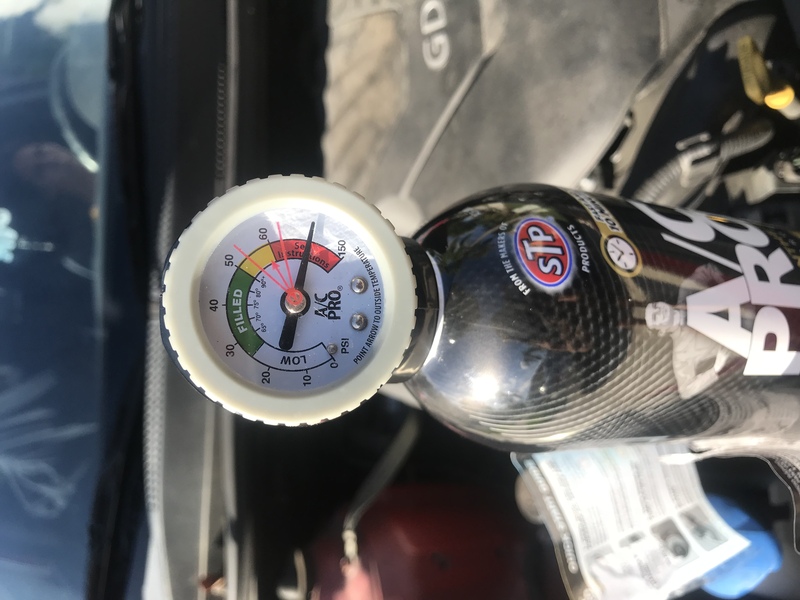 If you will notice on your gauge the white side 0-25 psi is just as big as the red side but the red side goes 60-150. That is a 90 psi difference on the red side. 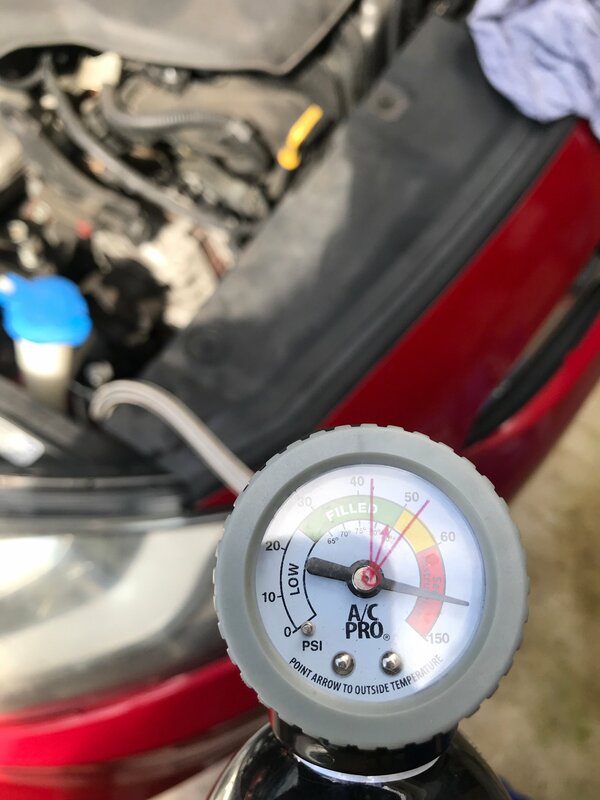 So this gauge is not going to be the best of accuracy because it looks like once it hits 60 psi it climbs very fast unlike the rest of the gauge. Not knowing the high side pressure, the possible causes for low side pressure to high. Are worn out faulty compressor. evacuated..High side is 240 psi and low side is 45.